In addition to showing you how to add, use and manage apps in Galaxy Note 7 home screen. New features of using apps in Galaxy Note 7 home screen are also illustrated. you can have multiple copies of the same app in Galaxy Note 7 home screen. This makes home screen different from apps screen (app drawer). removing an app from Galaxy Note 7 home screen does not affect the app. Actually, if there are multiple copies of the same app, removing one copy does not affect other copies at all. if an app was uninstalled or disabled, all app icons for the app in Galaxy Note 7 home screen will disappear automatically. But in Galaxy Note 7, Samsung introduced some new features for apps in Galaxy Note 7 home screen, including uninstalling apps, or putting apps into sleep from Galaxy note 7 home screen. This guide will show you how to use these new features and how to add, move, delete, and use apps in Galaxy Note 7 home screen. This guide is based on the default Galaxy Note 7 launcher. If you are using third-party launchers, you need check the manual for the corresponding launcher or the developer. What are new features of apps in Galaxy Note 7 home screen? There are a few new features for apps in Galaxy Note 7 home screen (compared to Galaxy Note 5) by introducing a new context menu. App info. You can check detailed app info of this app. Uninstall or disable. 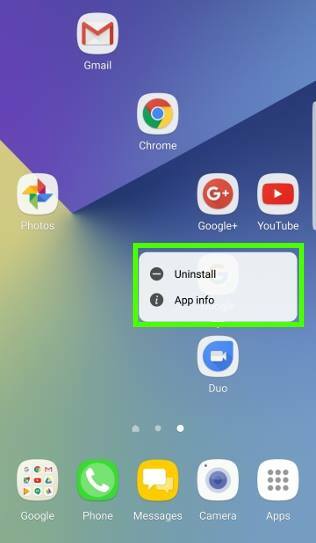 You can uninstall the app (if it was installed by you) or disable the app (if it was pre-installed). Put to sleep. This option shows only if the app is running in background. You can force it into sleep state to save battery. For example, in Galaxy Note 7 home screen, tap and hold Google Duo app icon, you will find 2 items: uninstall and app info, as shown below. The Put to sleep option is not available because the app is already in sleep state. You can tap App info to get the detailed info of this app as shown below. This is identical to what you will get by tapping Settings–Applications — Duo. If you tap and hold the Google+ app icon as shown above, you will see the 3 context menu options: app info, uninstall and put to sleep. You can now force the app to sleep state by tapping Put to sleep as shown above. Putting this app to sleep will prevent it from using battery in the background. 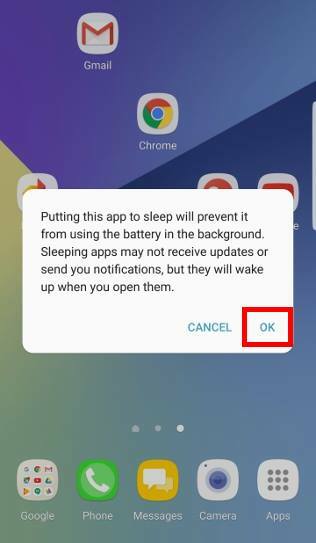 Sleeping apps may not receive updates or send you notifications, but they will wake up when you open them. Tap OK to proceed as shown above. Or tap Cancel to change your mind. Another new feature is that you now have the Move apps option in the top of screen when you tap and hold an app. Please read on. How to add apps to Galaxy Note 7 home screen? By default, when an app is installed from Play store, the shortcut will be added to home screen in Galaxy Note 7. However, many users may disable this feature in Play store settings inadvertently. 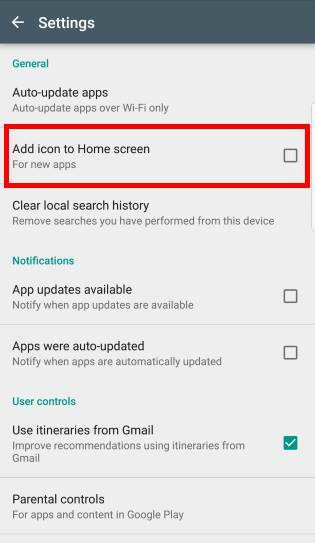 To enable (or disable) this feature of adding all new apps to Galaxy Note 7 home screen automatically, you can open Play store app, tap Hamburg bar, tap Settings as shown below. 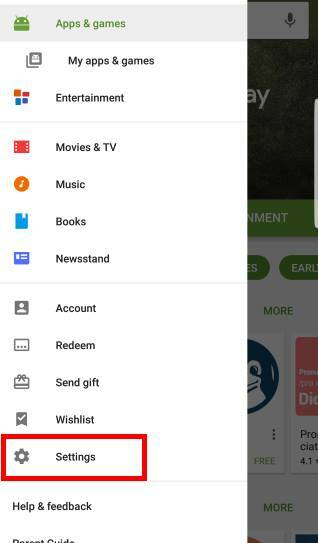 In the Google Play store Settings page, check setting for “Add icon to Home screen” as shown below. Of course, this only affects apps installed from now on. For apps already installed, you can add them to home screen from Galaxy Note 7 apps screen (app drawer). In Galaxy Note 7 apps screen, you can tap and hold any apps (or app folders) to add them to the home screen. How to move apps in Galaxy Note 7 home screen? To get a desired layout of your home screen, you can move apps in Galaxy Note 7 home screen as you want. There are at least two different ways to move apps in Galaxy Note 7 home screen. You can tap and hold an app icon, then move it to any desired locations in any home screen panels. Then drop it. This method works well if you move apps within same home screen panel. But thanks to the curved screen in Galaxy Note 7, it requires a lot of efforts and practices to move apps to other home screen panels with this method. When you try to cross over the edge of a screen, it can be painful experience. So, if you want to move the app icon to a different Galaxy Note 7 home screen panel, you should try the new method. Delete. You can move the app icon to this button to remove it from Galaxy Note 7 home screen. Move apps. This has been a new feature since Galaxy S7. You can use this button to easily move apps to any home screen panels. For example, as shown below, you want to move Chrome app to other home screen panels. 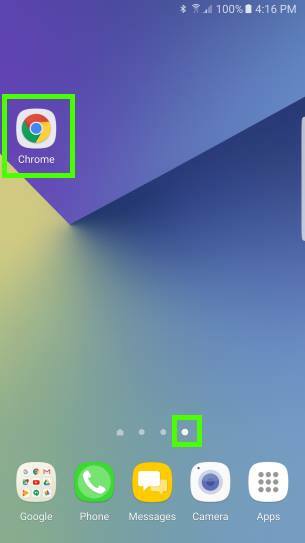 You drop Chrome app icon to the Move apps button as shown below. Now, Chrome is on top of the screen. If you want, you can add more apps to the top. You can navigate to any panels by swiping left/right, or using home screen indicators. 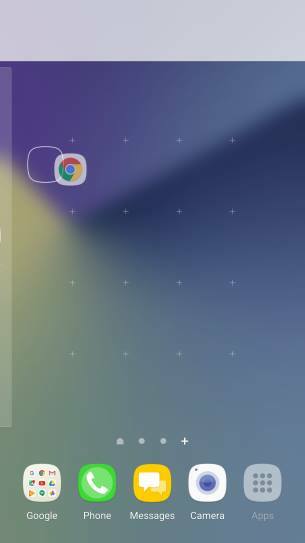 Once you find the desired home screen panel, drag Chrome app icon form the top to the desired spot as shown below. After you drop all apps to desired spots, Galaxy Note 7 home screen turns back to normal as shown below. 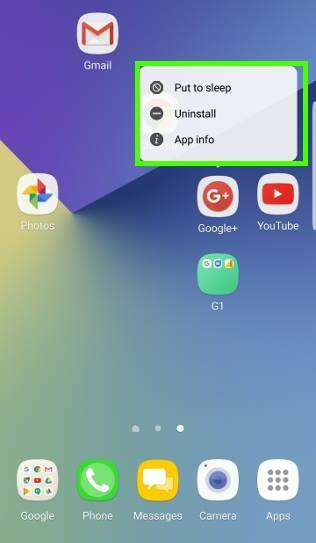 This method to move apps in Galaxy Note 7 home screen is very helpful if you are not comfortable with the old method when crossing home screen panels. 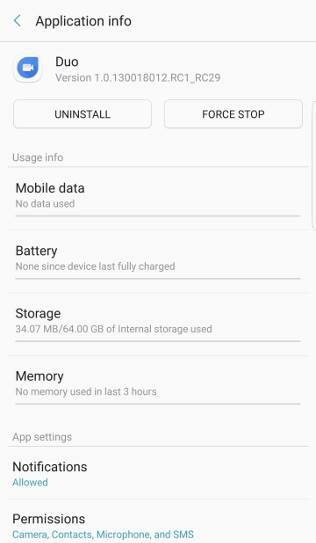 How to delete apps in Galaxy Note 7 home screen? The app will be removed from Galaxy Note 7 home screen after you release your finger from the screen. 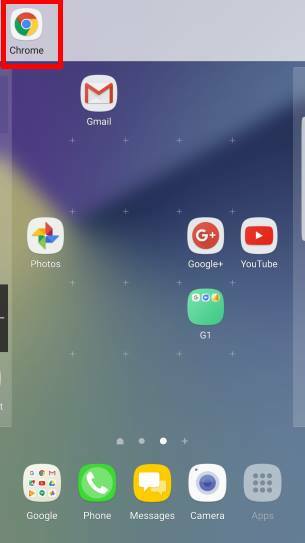 How to organize apps in app folders in Galaxy Note 7 home screen? When you have a lot of apps, you can organize apps into app folders in Galaxy Note 7 home screen. 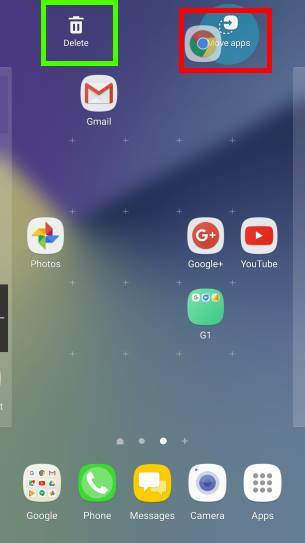 Please refer to this guide on creating, using and managing app folders in Galaxy Note 7 home screen. Can you add apps to Galaxy Note 7 home screen? can you manage apps in Galaxy Note 7 home screen? do you know the new features of apps in Galaxy Note 7 home screen? If you have any questions on using or managing apps in Galaxy Note 7 home screen, please let us know in the comment box below. For other detailed Galaxy S7 how-t0 guides, please check Galaxy Note 7 guides page.